I've been working on this project for some time now and am finally at the point where I feel it's time to start a thread to document the build. My history with Husabergs dates back to...well...before there were Husabergs. I was a Husqvarna guy in the 80's. My first was an '83 CR 250. Then I had an '83 CR 500, but the standout Husky for me was the '87 TC510 that I bought used in 1988. I was hooked right away. In 1996 my brother bought a 1995 Husaberg FE501. I was amazed at how much better that bike was than the old 510. The hook sank in even deeper. 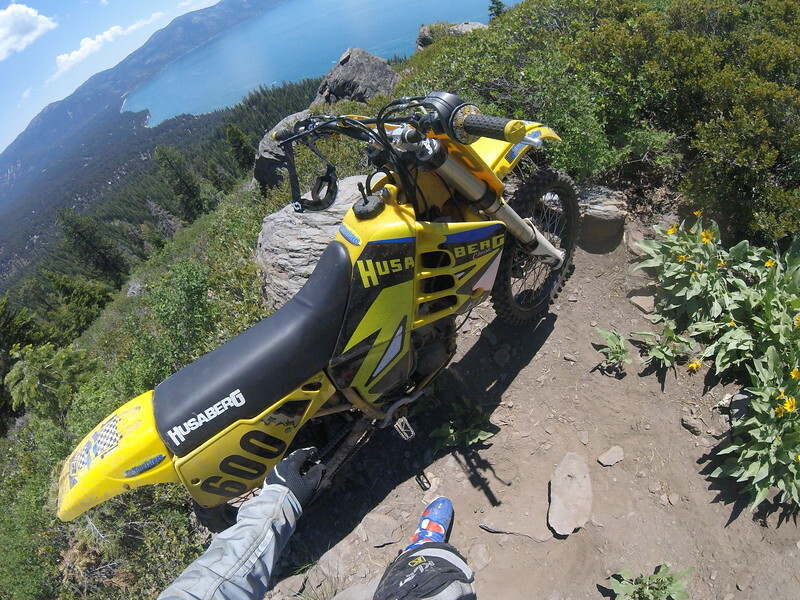 I've accumulated a few other Husabergs over the years culminating in a 2008 FE550 I bought for the specific purpose of racing the 2011 Vegas to Reno desert race. The bike was so exceptional everywhere that we ended up getting 8th overall. Sadly, I was forced to sell that bike to fund the refurbishment of the bathroom in my old house. Ever since then I've intended to build the ultimate Husaberg for myself. 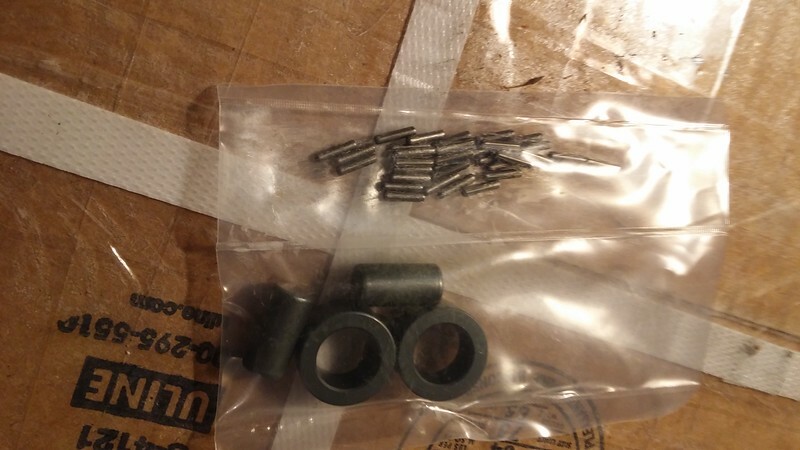 I wanted to start with something cheap because I was going to basically rebuild everything on the bike so, no sense breaking the bank right off the bat. I found a 1996 FC600 that I ended up purchasing for $400. I've posted about this bike plenty in other threads but, to recap, it had fallen out of the previous owner's truck and tumbled down the highway so it was thoroughly beat. Here's after spending a ton of time getting it at least worthy of a photo. 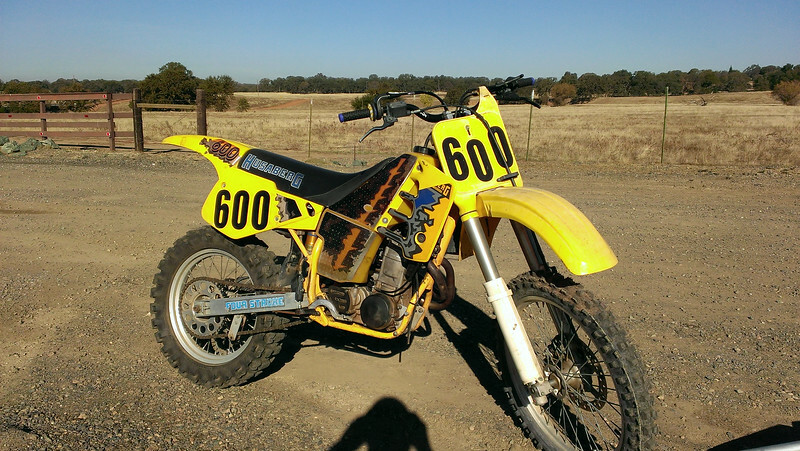 Added a Keihin FCR41MX from a 2008 KTM 450SXF. 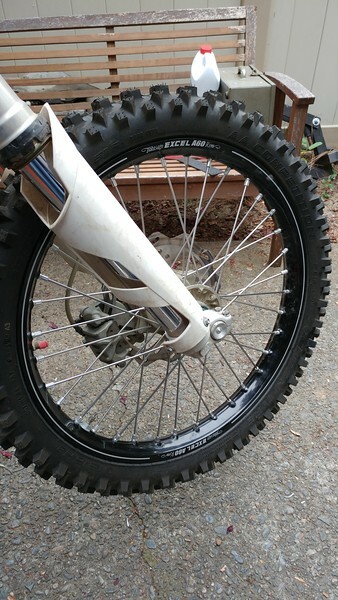 Swapped to 2013 KTM closed chamber forks and front brake with an Excel A60 laced to a KTM hub. Added an Eric's Machine aux tank I found on Ebay for a song and rigged up a pair of mounts for the stock fender flap. Plumbed it to the stock tank via a quick disconnect and an inline valve. Then I installed Taffy's graphics and seat cover and here's where she's at today. In addition to the cosmetic damage it had when I saved her, the engine was locked up. Since I was in the process of building my Husaberg/KTM hybrid engine I decided that here was my recipient for the engine. 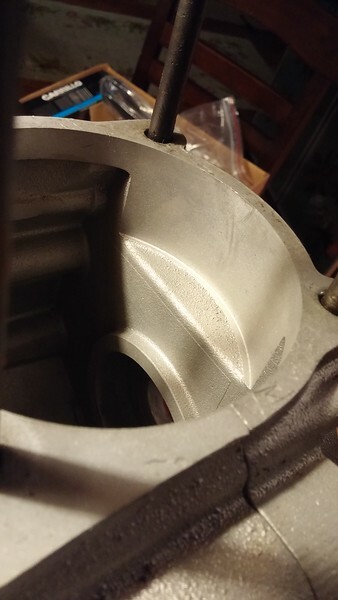 I have a second FC600 engine that I bought off of a guy in Boise who planned to install it in a go-kart but lost enthusiasm for the project (presumably when he discovered how difficult it would be to start with no electric boot). I always intended to do something crazy with this engine so...Here it comes! May you reap rich rewards! Please do keep the posts coming!! 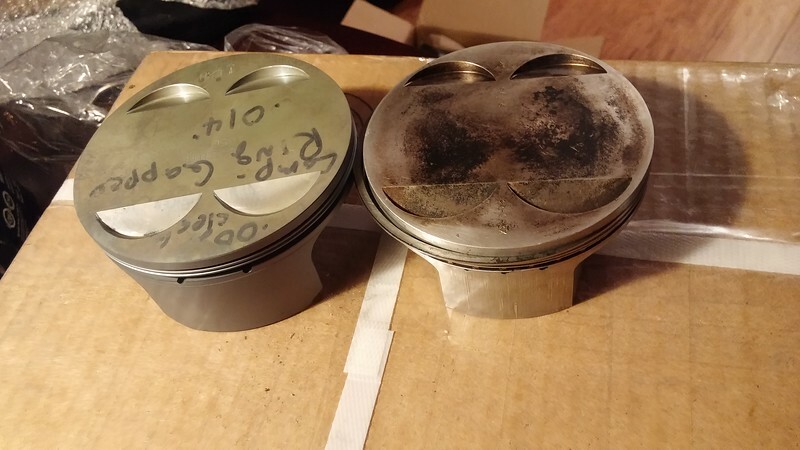 Stock 1996 600cc piston on the right at 95mm. 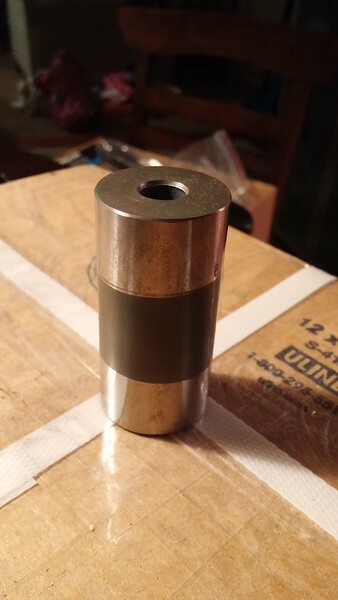 Stock 550 piston from Wossner (P/N 8551DA) at 100mm. Combine that with the stock 84mm stroke found in the 600's and you get 659.73cc. 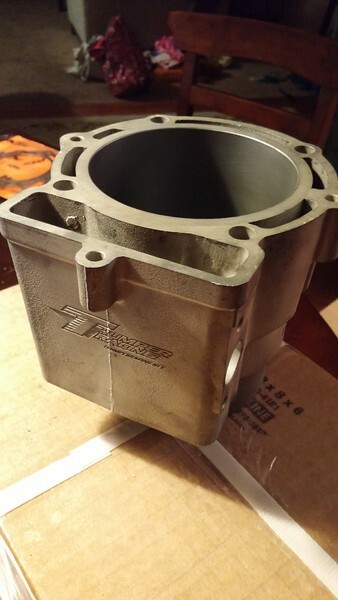 Cylinder bored and sleeved by Thumper Racing. The sleeve is cast iron. Not sure why Travis went that route over aluminum but...whatever. Cases bored to fit the sleeve. Here's the rebuildable Carrillo measuring the stock 130mm center-to-center. The rod pin showing a clearer example of the Microblue application in the center with the outers masked off where the crank webs get pressed on. 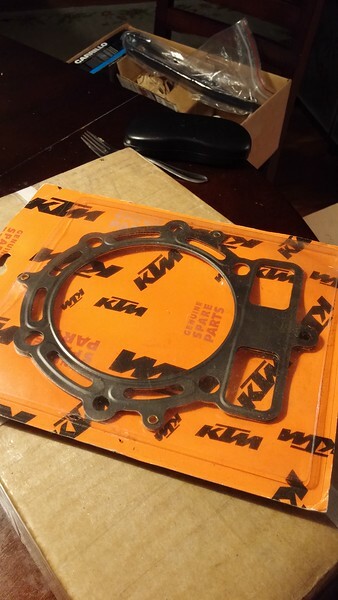 KTM 560 SMR head gasket for the 100mm bore. 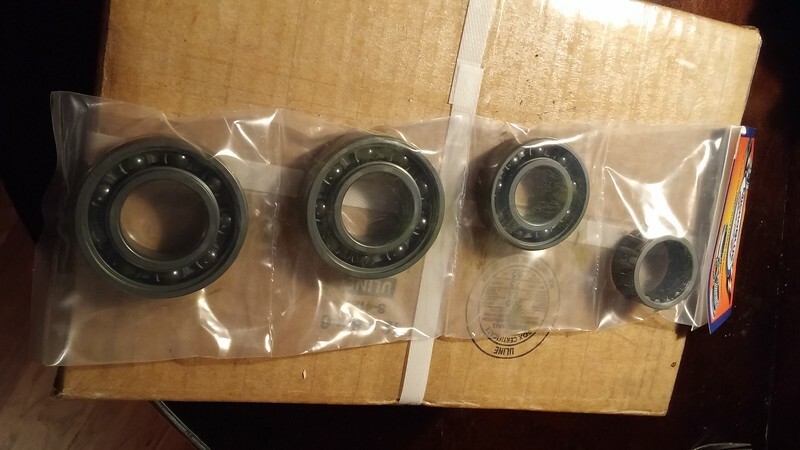 Microblue supplies their own line of bearings that are already treated. I went with the ceramic balls with steel races wherever possible. I also had Microblue treat the cam follower bearing races and needles as well as the rod bearing (seen in the previous photo). I have a titanium piston pin for this engine but apparently no pictures of it. It was a pin that Travis had for a KTM RFS engine but apparently never got used. To make matters worse (or "better" in my opinion because it indicates that progress is being made) I shipped the whole thing back to Thumper Racing earlier this week for final assembly and there will be no further opportunities for photos of internal engine components. I decided to leave the final machining and assembly work to the experts. 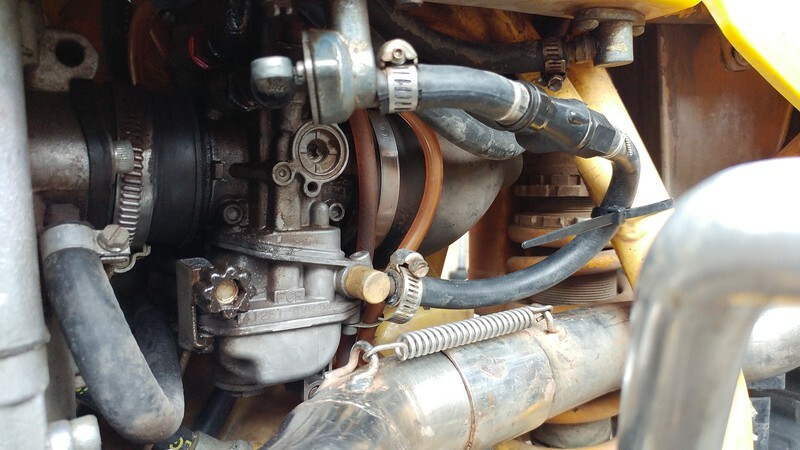 I've built a few engines but the sheer number that they deal with on a daily basis makes them far more experienced and I want to give this engine the best chance at longevity possible. But here's the best part. A phone conversation with Travis on Wednesday had me giddy in a work meeting I attended just after. My co-workers must think I'm a nut. Anyway, Thumper Racing will install the new rod, balance the rotating assembly, assemble the bottom end, Machine the valve pockets for 38mm inlets and 33mm exhausts, port the head to make use of those big valves, machine the combustion chamber for 13.5:1 compression (since I'm committed to using race gas exclusively in this engine), and then final assemble everything from the cases inwards as well as the top end. Since I like a more responsive engine at the potential cost of occasional stalling, I asked Travis if he would concentrate on weight removal from the heavy end of the crank when balancing. The added benefit here being that a lighter crank is, presumably, easier on main bearings. Future work will involve boring the carb but I'm going to hold off on that so I can afford to buy Christmas gifts. No sense getting THAT LOOK from the wife when there's nothing for our little one under the ol' X-mas tree. you're doing a great project. Keep us up to date with posts and pics. I also read about your coating at MicroBlue® The How It Works as you recommended. I could not find any detailed information about it - not on their homepage or anywhere else on the internet. What is it exactly and how does it work? I'm just curious about the coating stuff in general. Lower friction causes less wear and less thermal stress to all components in the drivetrain - of course - that makes sense. The stuff looks like black color coated - not blue. They give detailed information about material and coating hardness, etc. So you can compare it with other coatings. Then there is the research guys trying to market their stuff, like Fraunhofer with its Diamor, which is a DLC as well, but with little differences. They actually use graphite and implement it in the material surface that a diamond like strong structure can be made (I didn't read the details... sorry). Anyway. Same story: Material and specs are published somehow. Since I don't know any company that will coat my gears with one of those magic things - I'm wondering what actually MicroBlue is doing/using. Super-smooth-polished surfaces = low friction. Does the coating level out the left over microstructures? As far as I got it at MicroBlue's website - The superfinished surface comes before you coat it!?! What does it cost me if I also want my engine coated (with MicroBlue) and what's the value in return and can I trust the product? I've been keeping a spreadsheet on all the costs of the project and the Superfinish/Microblue part of it was $220. Unlike a coating such as DLC which makes a surface harder and more slippery so less damage is done when surface contact happens, Microblue attempts to avoid the surface contact from happening at all. It's "hydrophyllic" to oil ("oilphyllic"?). From what I understand, it tends to hold oil in the treated area. How it does this is completely beyond me. To be honest, I'm treating this as a big, expensive experiment because, if Microblue performs as advertised, then my engine should not see the typical early Husaberg failures (cam follower bearings and rod bearings in my experience) that have been so common. When I mentioned to Craig (the owner of Microblue) that this engine has no oil pump and is splash lubricated only, he was "very unconcerned". 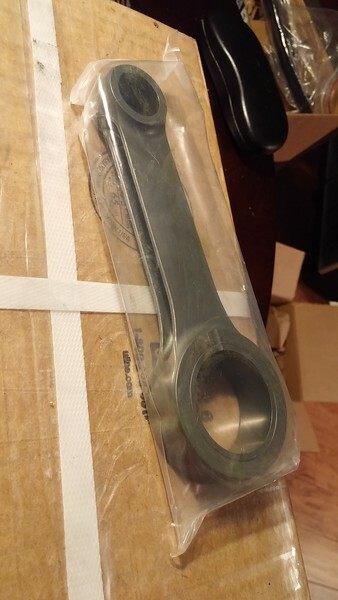 Indicentally, I also had the rod bearings, main bearings, pistons, wristpins, and piston rings for my Cummins 5.9L turbo diesel treated with Microblue as well. It's at about a 10 percent increase in fuel efficiency so far. It's not completely broken in yet so I'm hoping to see further improvements. It's difficult to say if this improvement is due to the Microblue, however, because I am also running a different camshaft which is advertised to increase fuel economy as well. At least there have been no detrimental effects so far. As far as specifics of the coating, I wouldn't expect Craig to give you all of the details but maybe it's worth a call at least. He's a nice guy and very knowledgeable. 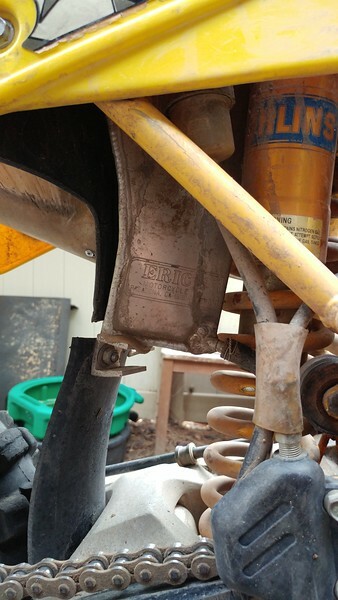 it would be great if this helps to prevent typical early Husaberg failures. Keep us up to date! I received a call from Travis about a week ago (and chose not to update this thread until just now out of sheer laziness). He has been extremely busy and, to make matters worse, his chief machinist has given notice that he's moving on. His workload makes a lot of sense as, even on little ol' Husaberg.org, I see a lot of guys sending business off to Thumper Racing. That's not to say that there's no progress. I originally asked him to balance the crank by means of weight removal only and it sounds as though he's accomplished that...and then some. Travis mentioned that he was able to remove 12 oz (340 grams) from the crank and that should be a noticeable improvement to the responsiveness of the engine. I was thrilled to hear this news. Next on the list of to-do's for this engine are assemble the cases, machine the head for larger valves, massage the combustion chamber for 13.5:1 compression ratio, port the intake and exhaust runners, and probably plenty of things that I've left out. As mentioned before, I've decided to hold off on machining out the carb venturi for financial reasons. Looking to early spring for this to happen. 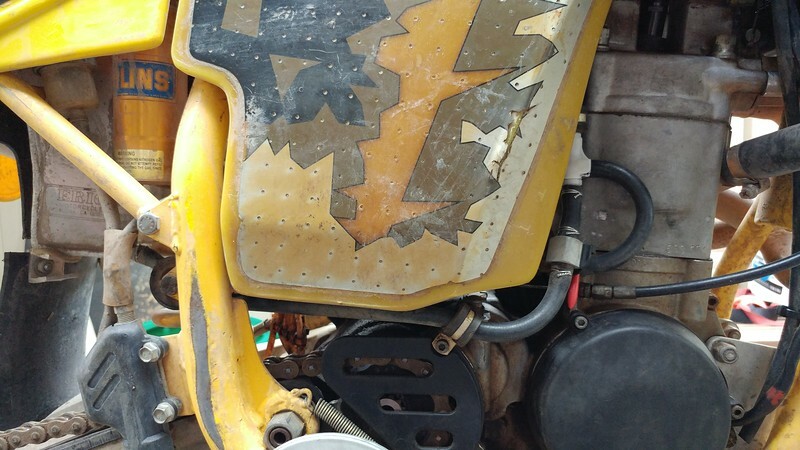 So there's the update on the Husaberg 660 project.